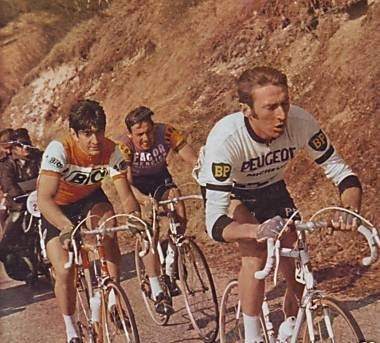 Above;1970 Paris to Nice - The Race to the Sun, Luis Ocana's first main stage race for BiC, following Roger Pingeon of Peugeot and behind George Chappe (Fagor/Mercier).On the right a modern day tilt of the BiC trade team jersey,hence the BiC name on the side panels as well as the raglan shoulder style amongst things, check it out against the one Ocana is wearing. 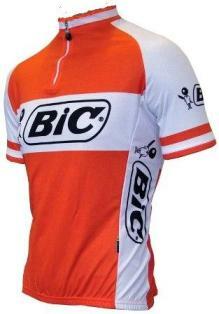 The above retro jersey actually sold a majority of time on eBay with a slight tint of moderisation with raglan shoulders and side panelling with the BiC name. 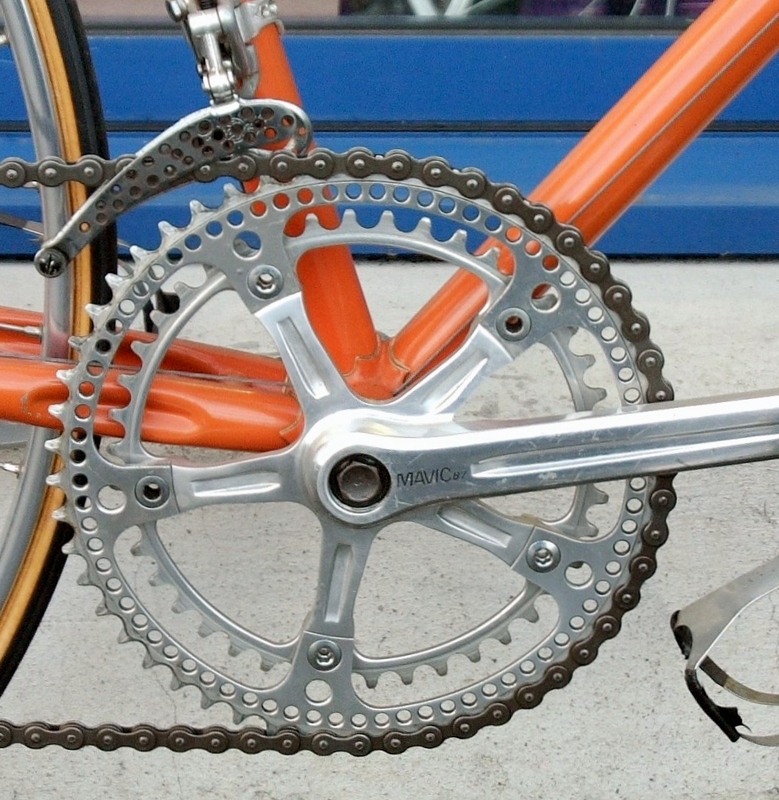 The three images below are very representable of Ocana - left, and centre the 1970 Tour de France, and on the right a very well drilled out chainset as well as the reinforce pieces of alloy having seen the hacksaw blade,read text below..
During the 1970s it didn't matter if you were a top class professional on the continent or simply that budding amateur cyclist, everyone was at it, either with a drill or a hacksaw. If it looked like you could get rid of some metal and lighten the bike in doing so you had ago, yeah even me. Mind you, you had to be careful! 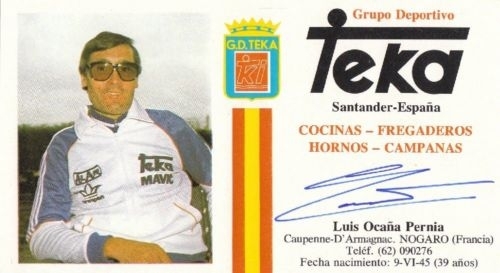 LUIS OCANA A Spaniard in France, my title to the book I am writing at the present time. 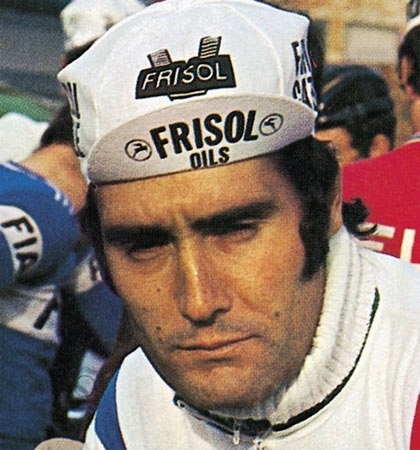 There were a number of books that came out when Ocana was at the height of his performance in cycling, although the editorials homed in on him from around 1968 when he signed for FAGOR on a two year contract, especially the horrific accident he had in the Tour de France in 1969, yes he liked to be spectacular either on or off the bike in the Tour. 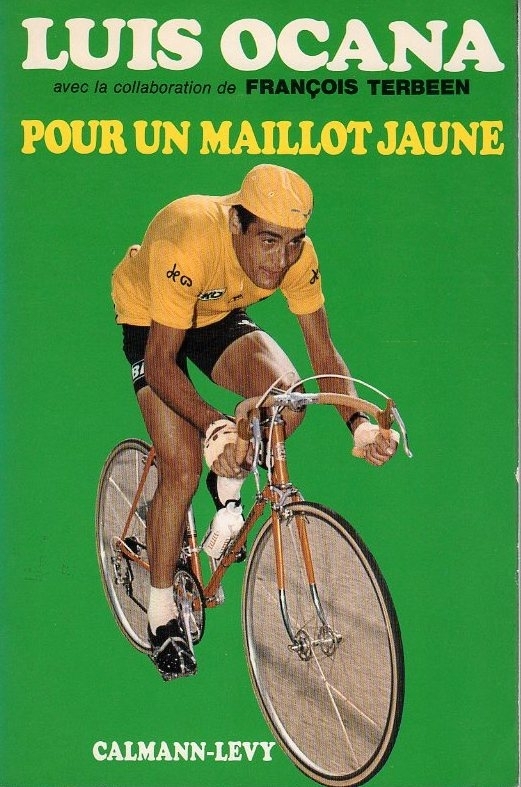 On the right of course is the cover of "For the Yellow Jersey", giving the reader the low down up to the end of 1971 season, yes the other year when Ocana had that dreadful accident that took him out of the Tour de France. 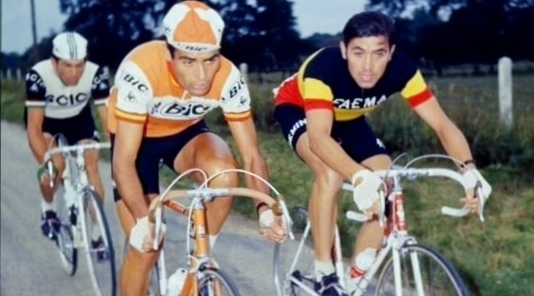 He actually appeared in more Tour of Spain - the Vuelta tours than the French equivalent, partially due the fact that he rode for a number of Spanish sponsors as well as the fact being of that nationality it was possibly written into his contract. 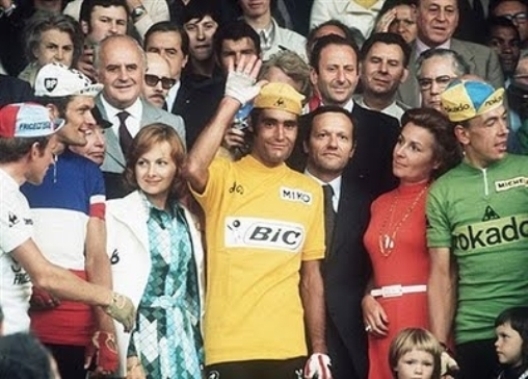 Above; Luis Ocana after winning the 1973 Tour de France,a ccompanied by his wife Josephine on his right, along with Joop Zoetemelk-white jersey/best young rider,Bernard Thevenet in his National French champion jersey and far right of this picture, Herman Van Springel in the green points jersey, which considering that this man was hopeless most of the time in sprinting one wonders how he managed to take a jersey that is normally won by a sprinter! 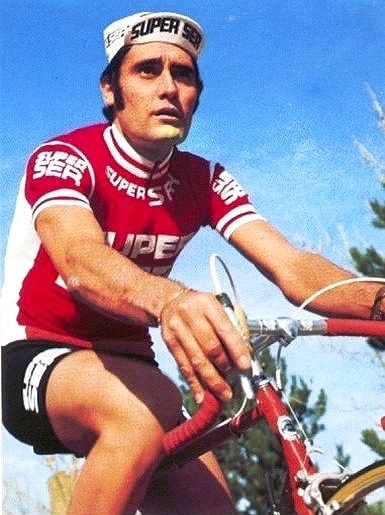 Above images; Red jersey denotes of course Super Ser 1975/6; Little images - top one show timetrialing for Fagor in the 1969 Vuelta - Tour of Spain.,Centre image shows his Director Sportif of Teka business card., Below image show the "Audax" jersey that supports the Luis Ocana sportif event which is normally in May of each year; Frisol Oils above - signed for them for one year in his retirement year of 1977 where he competed in both the Tour de France and the Tour of Spain. Well there is a significant amount of editorial on the Spaniard so inconsequence and hopefully it will be on par with the Brooklyn book in size and material. 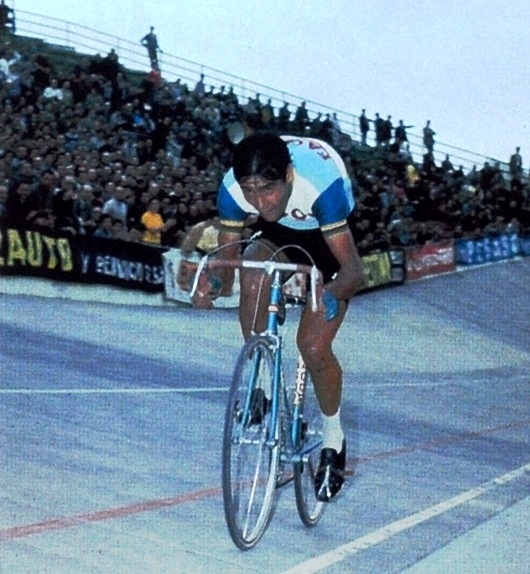 To give you an idea of further content, well Ocana was a dab hand at the odd time trial, either singularly - Grand Prix des Nations or two up - the Baracchi. So those significant victories will have reports upon them. 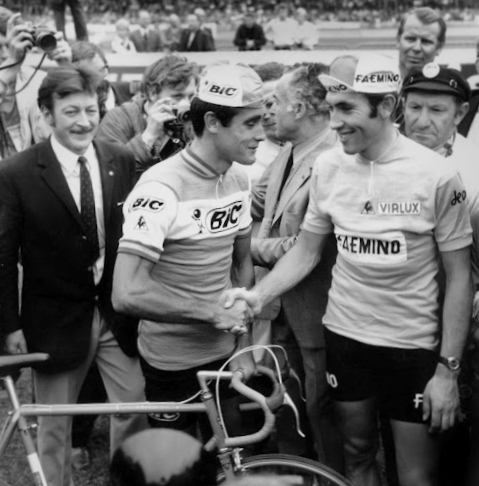 The 1973 Tour de France with a good number of images will have a indepth report of a good number of pages. It is rather unfortunate that after that particular year when everything he rode, he rode well, things were never the same. There will also be a piece upon the depression that seemingly was his downfall.At the moment I am around halfway through the writing. Price, well unfortunately everything is going up in this department so £30 plus the post and packing in the UK.